Welcome to Maine Historical Society! We look forward to hosting your visit—whether for a tour, a public program or special event, a school field trip, research in the library, a meeting or workshop, or just to sit in the garden for a relaxing lunch. We want to make your stay with us as enjoyable, informative, and memorable as possible. This page provides a variety of information related to coming onto our campus in downtown Portland, with links to all of our Visitor Services and programmatic offerings. We are located on busy Congress Street in downtown Portland, an historic and arts district that serves as the city's main thoroughfare. Congress is within short walking distance of the Old Port and waterfront. Map it. Written directions. Parking Information. Phone: 207-774-1822 Look up staff extensions. 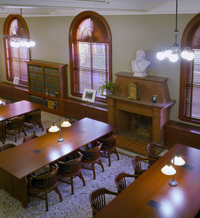 All of our facilities are fully accessible, with the exception of the second floor of the Wadsworth-Longfellow House; a full video tour of the second floor is available upon request. Visit the museum store to purchase tour and gallery tickets and to shop for popular and hard-to-find history books, unique gifts, and Maine-made items. 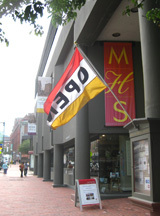 The museum gallery and store are located at 489 Congress Street in Portland. See below for parking information. Visit the online store. Learn about current exhibitions. May-October 31: Monday through Saturday 10am-5pm; Sundays 12pm-5pm. HOLIDAY HOURS: December 1 – 23: Tuesday-Friday, 10am-5pm; Saturday, 10am-5pm. Closed or reduced hours on select holidays. Whether you are conducting personal, educational, or professional research, our reference librarians are ready to assist you with accessing our diverse collections. Learn more about visiting the Library. Closed holidays and some holiday weekends, and will be closed for the winter holiday break both the weeks of Christmas and the New Year. Library Tours on the first Wednesday of the month at noon (with a few exceptions, call ahead). 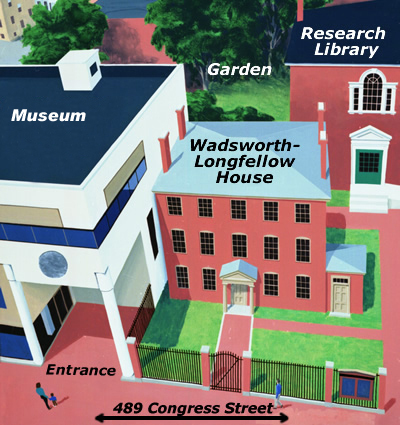 Download the Wadsworth Longfellow House App to enhance your self-guided experience! The boyhood home of poet Henry Wadsworth Longfellow is on the National Register of Historic Places. 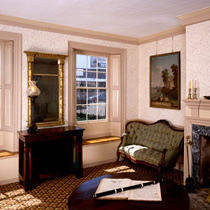 Visitors are invited to tour the house, from May - October. Times subject to change due to tour volume and staffing. May 1 - May 31: Monday-Sunday 12pm-5pm. Please call (207) 774-1822 for tour times. June-October: Monday-Saturday 10am-5pm. Sunday: 12pm-5pm. Please call (207) 774-1822 for tour times. Garden Hours: Open to the public during the season from 10am - 5pm. Price includes admission to gallery. House history, tour details, and ticket prices. Learn how your school can visit. This 75 minute guided tour to the city's waterfront highlights Portland's history, maritime heritage, and authentic character. Tours offered Monday through Friday at 1:30pm, weather permitting, and on select special weekend dates. Check our program calendar for more information. Tour details and ticket prices. Maine Historical offers lectures, book talks, workshops, and other public events year-round. Visit the Programs page for the latest on what's coming up. Email or call the Visitor Services Manager at 207-774-1822 x212 to arrange a group tour. Group rates are $10 per person. A $25 non-refundable deposit is required. Checks should be made payable to Maine Historical Society and mailed to address above. Call for credit card reservations. A 24-hour notice is requested for cancellations. Coach parking information. Take Route 95 south (Maine Turnpike) to Route 295 in Gardner (exit 51). From I–295 in Portland, take exit 7, Franklin Street. Travel up Franklin Street to the fourth light and turn right onto Congress Street. Take Congress Street past 5 blocks to the Portland Public Library on your right, and then past Preble Street. The Maine Historical Society is on the right, at 489 Congress Street, on the corner of Congress and Brown Streets. You will see the brick Wadsworth–Longfellow House on your right. Take Route 95 (Maine Turnpike) to I–295, exit 44. Take I–295 to exit 7, Franklin Street. Go up Franklin Street to the fourth light, then turn right onto Congress Street. Subject to availability, there are pay-to-park spaces offered on evenings and weekends only in the Maine Historical Society lot located on Brown Street behind Maine Historical Society’s 489 Congress Street location Many spots are reserved so please check before parking in a space. Several parking garages, within easy walking distance, as well as metered on-street parking are also available. Coaches may discharge passengers at the bus stop on Congress Street past Brown Street where they will be met by MHS staff. Vans needing wheelchair access may discharge passengers at the Brown Street sidewalk ramp (at the corner of Congress and Brown). For city bus schedules, visit Greater Portland Metro. Many of the routes drop passengers off directly across the street from the Maine Historical Society/Wadsworth-Longfellow House.